When events have sponsors I think that those companies putting something into an event should be supported. At this year’s Lendy Cowes Week there were several supporting sponsors adding that special something to this well- established sailing regatta. One of the supporting sponsors was Chatham. 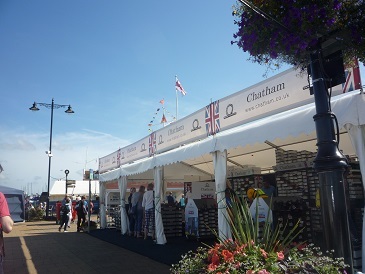 Having attended Cowes Week for five years Chatham (English Shoe Makers) once again had a large stand/retail unit on Cowes Parade in the home of the Parade Village. You might think Chatham shoes are for sailors and of course you would be correct as their deck and other easy to wear casual shoes are just right for on board. Many with non-slip soles could not be better for sailors who dash about on that slippery deck. However, in the cavern of a shoe-shop that pops up on Cowes Parade there are styles to suit all tastes and shoes suitable for most occasions. Just browse, try a pair or two or seek advice from the helpful staff. The choice is yours. Some sailors in the regatta regularly make a path to the Chatham stand and visitors and local residents are pleased to see a shoe shop in town with the chance to try on a new pair of shoes. Throughout Lendy Cowes Week Chatham gave away shoes as prizes in competitions organised by Cowes Week Radio and although there is a vast selection of colours and materials as well as sizes and styles a number of those purchasing shoes this year selected the new designs of OCEANIA and COMPASS II. OCEANIA, for ladies, comes in a mid-blue suede with matching latex rubber sole. Soft and flexible this is the most comfortable shoe. Although it could be described as a deck-shoe its colour and style is very wearable for most occasions and the mid-blue tones with most colours if that is a concern. The one through lace really works to tighten, forming a snug fit around the foot if that is your style and once laced the front bow adds a finishing touch. 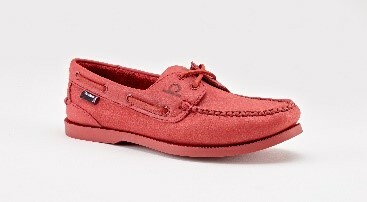 It is hand stitched at the back of the ankle and can be worn as ‘smart’ or casual and comes in sizes 4-7. My only slightly negative comment would be that the lace is too long- Chatham shoe makers please note- you could save some leather here! My only regret is that there is no colour choice in this style for those who don’t like blue but, of course, Chatham have a full range of styles and colours. However, COMPASS II which starts at size 6 comes in a selection of colours with toning or contrasting soles. To my mind this is the ‘men’s’ version of OCEANIA as sizes are available to 15. Both are, maybe, that slipper-feel shoe you have been waiting for.